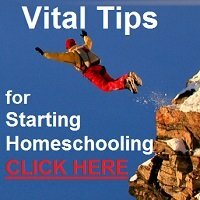 Tips for relaxed preschool homeschooling will help mothers see that there is more to learning than formal school-type activities during the preschool years. 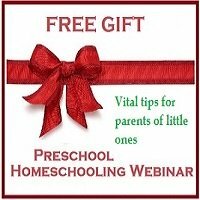 I am looking for a preschool curriculum for my child. He will be turning 3 in about two months. I looked at your sample lesson plan and was wondering what kind of a schedule would you have for a 3 year old. How long are the lessons or how long should I keep them? I always say that preschoolers don't need a curriculum BUT their MOM's do! Moms want to be sure that they are doing enough and that their kids are not missing out on anything! "In this time of extraordinary pressure, educational and social, perhaps a mother's first duty to her children is to secure for them a quiet and growing time, a full six years of passive receptive life, the waking part of it for the most part spent out in the fresh air." ..and another "...a child needs several hours of physical activity a day. This helps to build the body, purify the blood, promote good digestion and calm the nerves." That's another MUST READ ARTICLE and a good quote to remember! The question then is how do we, parents and caregivers in the 21st century ensure that our children have a "quiet and growing time...of passive receptive life..." mostly spent out in the fresh air? How do we get our kids away from TV, PC games and other passive activities that don't give them the all round stimulation that they need? 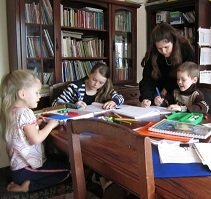 What is relaxed preschool homeschooling? Life skills: hygiene, cleaning rooms, shopping, cooking, baking, gardening, library visits. Spiritual life: Praying, reading the Bible, listening or singing gospel songs. Learning: Reading, moms' groups, nature walks, round the block pre-dinner walks. Gross motor: gardening, jungle gyms or parks, learning to ride a bike. Exercise: Bikes, walks, beaching, swimming, ball games. Crafts: painting, play dough, recycled models, scrap booking. Play: imaginative, toys, friends, role playing. Out and About: communities around them, who the community helpers are e.g. policemen, car guards, postman, rubbish collectors"
Preschool Training - by me! Play is the Work of Childhood. 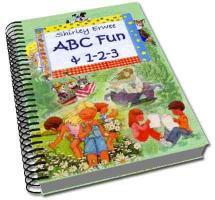 - a MUST READ for all parents of little ones. ...and if you are a mom of a child between ages 3-6 years that really needs the security of a curriculum, then choose one that is age-appropriate and gentle, like ABC Fun & 1-2-3!